Elias Theodorou garners as much attention for his efforts outside of the Octagon as he does for the work he’s done inside the cage, which is saying something because the Canadian boasts a 5-2 record under the UFC banner since defeating his countryman Sheldon Westcott to win the middleweight competition on The Ultimate Fighter: Nations a little over four years ago. Then again, when you have an engaging social media presence, the best hair in MMA, a shampoo sponsorship to validate those claims and spend the occasional weekend working as a “Ring Boy” for Invicta FC, you can understand why some people manage to overlook the fact that Theodorou currently sits on the fringes of the Top 15 in the middleweight ranks as he prepares to face off with Trevor Smith this weekend in Liverpool, England. Theodorou worked his second show for Invicta FC at the start of the month and while he wasn’t necessarily as dialed in as he will be this weekend when he steps into the cage, the Mississauga, Ontario native was already in tremendous shape, which should make his final preparations even easier once he touches down in the town where the River Mersey meets the Irish Sea. And when he steps off the plane, he won’t be alone. Theodorou is one of four fighters representing Montreal’s Tristar Gym scheduled to make the trans-Atlantic trek to compete this weekend in Liverpool, joining Eric Spicely, Nordine Taleb and Arnold Allen, and he admits that having that many teammates pushing towards the same goal has ratcheted up his intensity and excitement through this camp. “Obviously we’re all on the same wavelength,” he said of his teammates and training partners that he will compete alongside on Saturday night at the Echo Arena. “There are four of us from Tristar and there are even more people from the gym that are going to come out and, beyond us all being motivated, we’re all on the same clock. 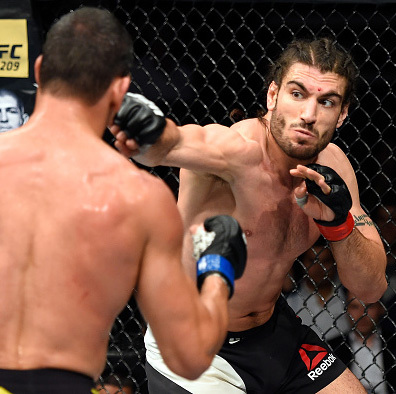 From the time he arrived in the UFC, Theodorou has been quick to remind people that while many of his contemporaries made the shift to mixed martial arts from another discipline, he got a relatively late start when it comes to pursuing his craft and came in with zero previous experience to fall back on. In recent years, he’s opted to ditch the time-consuming commute that comes with training in Toronto for living in the dorms at Tristar and making the short walk down the hall and into the gym. It’s an immersive experience and one that the talented Canadian credits with helping him continue to make headway in his personal journey as a fighter. “People from all over the world come and train and I get to train with some of the best that stop in – people that no one has ever heard of with all these different styles – and it allows me to absorb, learn and grow in my own right,” explained Theodorou, who picked up a unanimous decision win over Daniel Kelly back in November. “With a mastermind like Firas and how he’s been able to really work with me on my own unique style – same thing with Kru Ash out of Titans Academy – it has allowed me not only to avoid the wasted time commuting, but also to detach myself from any distractions. Coming off his victory over Kelly and having earned wins in three of his last four appearances, a showdown with Smith, a seasoned vet, might not seem like the obvious next step for Theodorou. But after being out of action since November, the soon-to-be 30-year-old is happy to get the chance to step into the Octgaon again and views this weekend’s UFC FIGHT PASS Featured Prelim as a chance to take another big step forward in his career by making a statement in Liverpool. “He’s coming off a win over Chris Camozzi, he’s a tough individual in his own right and he has 10 fights in the UFC,” he said of Smith. “But it’s not just who you want to fight, either; it’s who is available, too. “There are 500 fighters on the roster and a lot of this is musical chairs. (The fact that this isn’t a fight people necessarily expected for me) adds a little more pressure in regards to expectations because anything other than a finish, I won’t be as happy with.